For the best discounts on bunk beds and loft beds, take a look at our local deals for Orange County, Los Angeles and San Diego residents. For additional savings, pickup your order directly from our warehouse! The Dillon bunk bed line is available in many configurations: twin over twin, twin over full, full over full, XL twin over XL twin, XL twin over Queen, XL full over Queen and Queen over Queen. The line is available in white, black, navy blue, espresso, dark pecan and walnut. Also available are matching under bed drawers and under bed trundle. 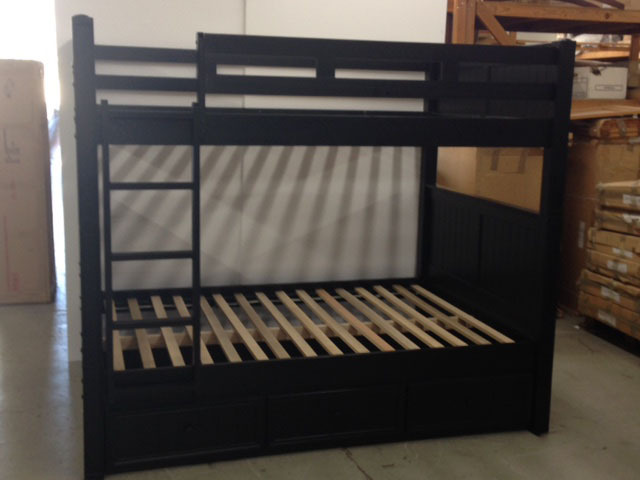 Southern California residents are welcome to view the Dillon bunk bed at our warehouse. Please give us a call to schedule an appointment. Any items not in stock can be made available within 2 to 3 business days of purchase ( Subject to availability ). We also offer white glove delivery service in Orange County and most of Los Angeles? We offer inside delivery and assembly in Irvine, Costa Mesa, New Port Beach, Lake Forest, Laguna Hills, Mission Viejo, Laguna Niguel, San Clemente, Santa Ana, Fullerton, Garden Grove and most of Orange County and Los Angeles. This service includes inside placement of bunk beds or loft beds, assembly and cardboard removal after completion of service. Please contact us for rates.